Sometimes I make these cookies when I want to pretend like I’m eating something healthy, but what I really want to eat is a cookie. 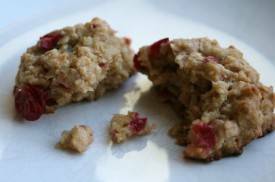 The inclusion of cranberries, oatmeal, and honey make it somehow seem more wholesome – but in reality, the amount of butter and sweeteners in this cookie make it just that: a delicious cookie. 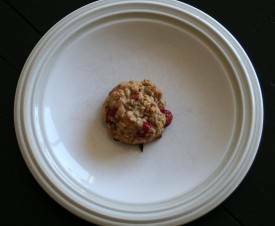 I also love that this cookie contains no leaveners – its structure and height depends on oatmeal alone. 3) Beat in eggs one at a time, then add the honey. 4) In a separate bowl, stir together flour, oats, cinnamon, and salt. 5) Add dry ingredients to butter mixture, and mix on low until just combined. 6) Stir in chopped cranberries. 7) Drop spoonfuls on cookie sheet, flatten slightly, and bake for 10-12 minutes. After a few minutes, move warm cookies to cooling rack. 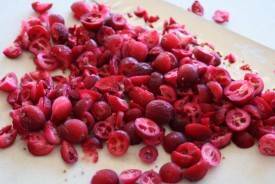 You can use frozen cranberries without thawing – in fact, they are much easier to chop this way. You can use dried cranberries if you don’t have any fresh. Adding a few cups of dark chocolate chips never hurt this cookie.